One of the first sweet apples of the season, Sansa ripens about a week before Gala. It has a well developed flavor that is complex and not just sweet. It has bright red stripes on a yellow background and has a similar appearance to Gala. It was first introduced into the United States in 1986, from a cooperative breeding effort between New Zealand and Japan. It’s parents are Gala and Akane. Sansa picks in late August. Zestar! is an early season apple with a sprightly sweet-tart taste with a hint of brown sugar. It has a light, crisp texture unlike many other early season apples that have a more soft texture. Released from the University of Minnesota breeding program in 1999, it came from a cross of State Fair and MN1691. Picked in late August to early September. We are just planting these trees in 2012, so won’t have a crop until about 2015. A strong flavored, zesty apple that tends to be smaller in size. The intense flavor reminds us of the sweet tart candy we used to get as kids. First introduced in Germany in the 1930’s, this apple results from a cross of Cox’s Orange Pippen and Duchess of Oldenburg. It has cream colored flesh and is crisp when first picked, but does not store well. This is an apple often seen in Europe, but rarely in the United States. Picks in early September. A popular variety in the Eastern United States and Canada, McIntosh is difficult to find in the West. A tart, aromatic apple with an white flesh and an open texture. McIntosh results from a cross between Fameuse and Detroit Red. It was crossed on the farm of John McIntosh in Ontario, Canada in 1870. While the apple is crisp first off the tree, it does not store well and tends to soften quickly. We pick McIntosh in mid-September. Sweet, with a tang! Jonagold embodies the sweetness of its parent Golden Delicious, and the tart zip of its other parent, Jonathan. Picked properly, its hard to beat a Jonagold for all around flavor. 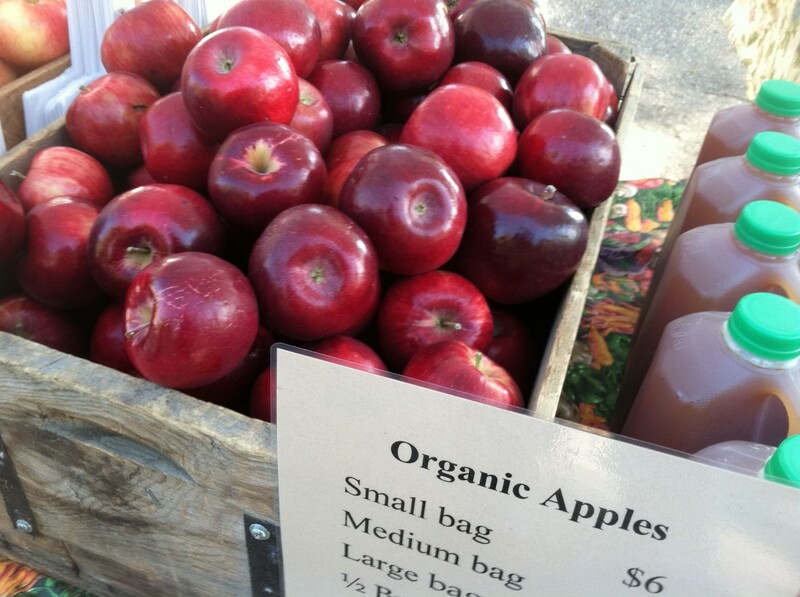 A favorite at our markets where couples that like both sweet and tart find a place to agree. Like Jonathan, it is does not keep well and is at its peak in September and early October. Jonagold makes an excellent apple sauce that is sweet with a bit of tart. Look for Jonagold starting in the middle of September. Sweet, spicy and crunchy! A late season apple that has very dense texture, keeps incredibly well and is a delight to eat at any time. Fuji develops a deep red color in our Indian summer days and cool fall nights. The sweet flavor continues to develop even after the apple is picked. This apple is a wonderful keeper and can be used through the holidays for eating fresh or made into pies and sauce. When kept at 32 degrees, we often enjoy Fuji’s well into March here on the farm. They are unique in that as they age, the skin may shrivel a bit – this always make us think they will be soft. But, even then they still have a snap when eaten! Fuji’s are picked in mid-to-late October. Tart, with full luscious flavor. 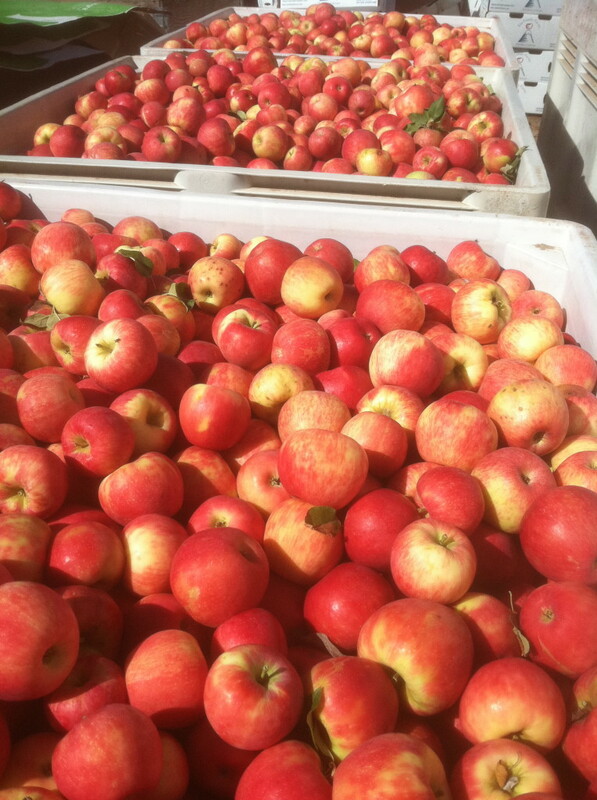 Braeburn is one of the last apples of the season to be picked, right after Fuji. The tart flavor makes your mouth tingle followed by its sugar that makes your mouth smile. A very good keeping apple that develops more sweetness as it is stored. To us, it is often better in late November than it is right off the tree. 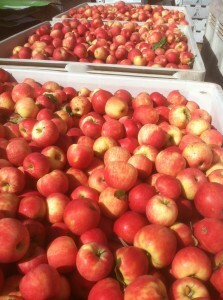 A great Christmas apple that is wonderful fresh or in pies and sauces. This is another favorite apple of our local distillery and makes a nice vodka and gin. Look for Braeburns in mid-to-late October.